Discussion in 'PMP' started by Ashish Malik, Jun 9, 2018. Q: Which of the following is NOT a tool used in the “conduct procurements” process? Please let me know why B is not the correct Answer. Contract types are selected in developing the Procurement Management plan ('contract payment types'). Independent estimates are also part of the Procurement Management Plan. It's not called Procurement Negotiation, but simply 'negotiation'. It, along with proposal evaluation, bidder conferences, advertising, and expert judgement are the tools/techniques. I have an assumption of why this question is a bit off - what is the source of this question? This Question & its explanation is from Simplilearn mock exam. Besides that, if i go by 5th edition, then definitely Independent estimates was a tool and technique in Conduct procurement, but, that is not the case anymore now in 6th edition. As per to 6th Edition, Independent estimates is an output of plan procurement. So, I'm really confused now, why B is not the correct option. Though I equally understand, "Contract types" is not a tool and technique in Conduct procurement, but neither does the Independent estimates. So how to go about such questions? Please help. Independent Estimates can be a technique in this process. It's just good practice to confirm you use it in Planning. The authors of the PMBOK guide are not trying to limit the tools & techniques, but focus on what surveys, interviews, and general good practice say is the way it is done well today. The processes, as documented are a summary. The exam questions will not place you in a dilemma. There will always be one and only one answer. It's a combination of the PMBOK material, the Code of Ethics, and generally what PMs do - collected and validated in the Exam Content outline. The exam is based on the 6th edition now, not the 5th. We can talk about 5th edition content, but I recommend we do so only to compare with what is now the PMBOK. My only point in referring to the 5th edition was because, in 5th edition, Individual estimates were Tools and techniques in Conduct procurement. but that is not the case in 6th Edition anymore. However, in 6th Edition, Individual estimates are clearly stated as one of the outputs in the Plan procurement, and Contract types being as input in Plan procurement. Secondly, another analogy of choosing Individual estimates as my correct answer; Contract types are not even mentioned/discussed during conduct procurement process, however, Individual estimates are. They are part of the Bid document, which are inputs to Conduct procurement. So, i personally and best to my knowledge still unable to understand how & why to select Contract types as the answer to this question and not the Individual estimates. So, on this question, I'm still unable to understand the justification. Again, you have a point. Independent estimates are by definition input/output, and not tools/techniques. They and contract types will be embedded in the COnfiguration Management Plan, so that document will have the reference from planning. How to Deal With ITTO Based Questions in the PMP Exam? If you ask any PMP aspirants about the scariest part of the PMP exam, most likely you will get the same answer. Yes, these are ITTO based questions. Everybody is scared of ITTO based questions and they are always trying to find the easiest way to solve them. This is a never-ending process because there is no shortcut to solve these type of questions. If you are preparing for the PMP exam, you will also be spending your time with these kinds of thoughts, and are afraid that you may fail the exam as a result. The only option you can think of is to blindly memorize all ITTOs in the hopes it will help you solve this type of question. Not only you, but almost everybody who is going for the PMP certification exam will have the same thoughts. The discussion on “how to solve ITTO based questions” has taken place many times in many PMP related forums, groups, and various blogs. However, it is still being discussed passionately because none of these forums, groups or blogs deliver the answer to satisfy the nervousness of the PMP aspirants. Every PMP aspirant is looking for a shortcut to solve this kind of question. Anyway, in this blog post, I am going to talk about ITTO based questions, my strategy to deal with them, and then finally how you should prepare yourself to handle ITTO based questions. What are ITTO Based Questions? ITTO stands for Input, Tools & Technique, and Output. The PMBOK Guide is divided into knowledge areas and each knowledge area has many processes. We know that every process has some input and it gives output with the help of some tools and techniques. For example, let’s look at the “Create WBS” process. In this process, you create the WBS. Input is something that you will need to create the output. In this case, the input will be a scope management plan, a requirement document, and a scope statement, etc. These plans and documents are necessary to create the WBS. Therefore, these are called “input”. Now you have the required material to create the WBS. The next step is to create the WBS. You will use your experience, knowledge, and best judgment and decompose the work into manageable parts, which is called the WBS. In the decomposition process, you have used your experience and knowledge, and this is your “Tools & Techniques”. Obviously, this process was to create the WBS, so the Output will be the “WBS”. So, you have seen what the Input, Output, and Tools & Techniques are. What is the output of the Create WBS process? Let’s discuss each option one by one. Risk register is an output of the Identify Risks process, project charter is an output of the Develop Project Charter process, and stakeholder register is an output of the Identify Stakeholders process. Clearly, none of them are correct. And now we are left with the last option, i.e. scope baseline. This is now our remaining choice but it does not seem to be correct in prima facie. Now, if you dig further into the scope baseline, you will find out that the scope baseline consists of scope statement, WBS, and WBS Dictionary. Since it consists of WBS and the name of the process is Create WBS, this must be the correct answer. This is an example of questions based on ITTO which you are going to see in the exam. The questions may also ask for the input of a process or they may give you the name of the process and ask you to identify the correct tool and technique for the given process. Honestly, I never had any strategy to deal with ITTO based questions during my PMP exam preparation. Moreover, I never looked for any strategy, shortcut, or tricks to remember ITTOs. My focus was on my study materials and the PMBOK Guide. I used to read the books along with the PMBOK Guide. A few times I had drawn my own memory maps to visualize the process flow and find the errors in it. This helped me understand the ITTO and the process flow significantly. I repeated this process many times, and at the end, I was very confident in solving ITTO based questions. How Should You Prepare Yourself for ITTO Based Questions? I suggest you follow the way I used to understand ITTO. The PMBOK Guide has 47 processes and each process has many ITTO, and believe me, it is very difficult to memorize all those ITTOs. How do I memorize or remember ITTOs? How do I solve questions based on ITTOs? In different places, you’ll find different suggestions, tricks and tips, but here I’m going to tell you how you should really deal with ITTO. Is it possible for everyone to memorize all ITTOs? Does the PMI really want you to memorize these ITTOs to pass the PMP exam? Why does the PMI ask questions based on ITTO in the PMP exam? The PMBOK Guide 5th edition has 10 knowledge areas and these knowledge areas have 47 processes. These processes have hundreds of inputs, tools & techniques and outputs and I doubt that every one of you has the capability to memorize all these ITTOs. Also, I don’t think the purpose of the PMP exam is to test your memorization power. PMI never designed ITTO to be memorized, and if you are doing this to pass your exam then you are exploiting the whole certification process, and most importantly, you’re ignoring the logic behind these ITTOs. You may think, what is the purpose of ITTO based questions and why does the PMI want you to answer these questions? How do the processes flow? How are the processes interrelated to one another? How do the processes depend on one another? How do the processes affect one another? Therefore, you must take some time to think about it, study the processes in the PMBOK Guide as many times as you can, and visualize the relationship among the processes. In the above example where the question is asking about the output of the Create WBS process, although you may guess that the output can be WBS, this option is not given in the answer. The given option is scope baseline which consists of WBS, WBS dictionary, and scope statement. Therefore, the answer will be scope baseline. Likewise, there will be many ITTO based questions in the exam where answers will not be clear. So again, read the PMBOK Guide, understand the concept, and try to visualize the process. Trust me, it is not as difficult as it seems. ITTO based questions constitute a large part of the exam questions and they can help you score in the exam. Unfortunately, many PMP aspirants don’t try to understand the logic behind these ITTO based questions and either avoid them, try to blindly memorize them, or look for tricks and tips to remember these ITTOs. Please note that these ITTOs are not developed to be memorized; they are created to make you understand the project management processes flow. If you try to memorize or avoid it, you are dismissing all logic behind the ITTO and devaluing the PMP certification process. How to memorize PMP® Inputs and Outputs? Each process of PMBOK® Guide has on average seven ITTO per process, and it makes around 300 total ITTOs. This number scares many of you; let me give you the good news here. You are required to learn much less number of these ITTOs. Most of the Input, Tools & Techniques, and Outputs are commonly used throughout PMBOK® Guide and PMP® certification trainings. All you need is to become fluent in these commonly used ITTOs. The PMBOK® Guide also helps you in learning these ITTOs. Enterprise Environmental Factors & Organization Process Assets: Many of you get confused which input comes in Enterprise Environmental Factor (EEF) and which one comes in Organization Process Assets (OPA). EEF are factors which are outside the control of Project Team, and these are surrounded around your project. While OPA represents already available lesson learned, checklist, templates which organization has developed from the past projects learning. You may read more on the details of Enterprise Environmental Factors and Organization Process Assets. Project Management Plan: The Project Management Plan in PMBOK® Guide is central to all the project work and defines how the project will be executed, monitored & controlled, and closed. You may easily observe that Project Management Plan comes as an Input in most of the Planning processes because it provides an approach to developing plans. Also, as it defines how to do work and how to monitor the project progress, thus it comes in many Execution and Monitoring & Controlling processes. 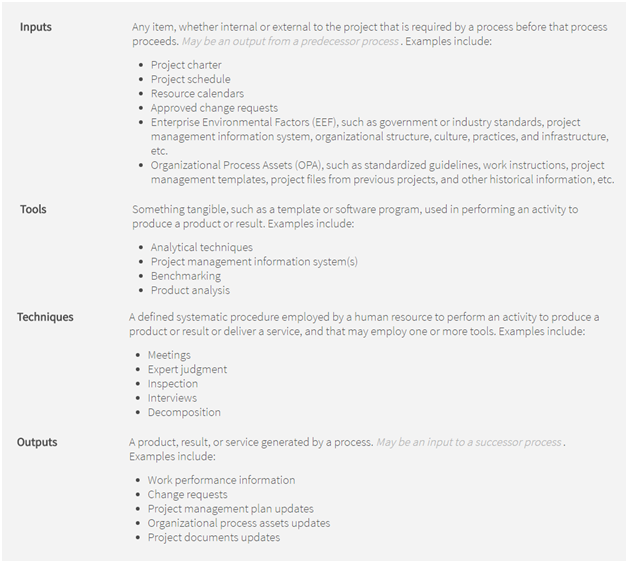 In summary, you can see Project Management Plan as an Input in half of the processes. Work Performance Information: The Work Performance Information is the output of controlling processes and gives your stakeholders a status of project deliverable s, like if the project meets the quality standards and how the project is performing against cost and schedule estimates. Work performance information is the valuable information in taking many project decisions and serves input to Monitor & Control project work to generate integrated work performance report. Expert Judgement: To meet the goal of a process, whenever you engage your stakeholders most of the time you are taking information for what they know (Expert Judgement) about the topic under discussion. In PMBOK® Guide Fifth Edition, Expert Judgement is most commonly used in planning processes. Project Management Information System: (PMIS): In PMBOK® Guide, the PMIS represents access to tools for collection & distribution of information, and interfaces to other online automated systems. It is also considered to be an Enterprise Environmental Factor, as it comes from the organization environment and influence the project execution. It is a valuable tool to know for many PMBOK® processes. Change Requests: As project moves in execution as a result of work performed, most of the processes generate the Change Requests. All of these changes are processes through Integrated Change Control Process and goes as an input there. If these changes are approved, it usually updates the Project Management Plan and other Project Baselines. Updates: The updates in the Project Management Plan and Project Documents are typical output in many planning, execution, and Monitoring & Controlling Process. You may observe these updates throughout the PMBOK® Guide.